DIAMONDS AND RUBIES IS SIMPLY THE BEST PERFUME I'VE USED. I LOVE DIAMONDS & RUBIES. PEOPLE ALWAYS ASKED ME WHAT I'M WEARING. Just got it in the mail and I love it. Diamonds and Rubies is a new favorite of mine! My husband doesn't usually notice a fragrance on me but he loves this one! It's a definite winner! I will reorder! Thanks! 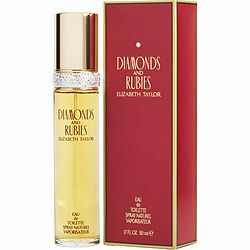 DIAMONDS & RUBIES I love this perfume & it is very hard to locate. Super happy Fragrance Net did.